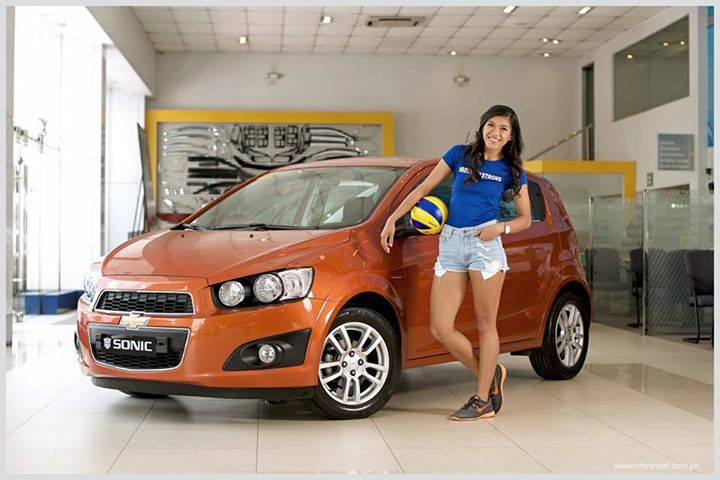 Chevrolet Philippines teams up with the country’s top volleyball star and reigning UAAP Women’s Volleyball MVP - Alyssa Valdez as she is officially appointed as the 2015 Chevrolet Sonic’s sports and lifestyle ambassador. Alyssa is a multi-awarded athlete and team captain of the 2014 UAAP champions Ateneo Blue eagles and of the 2015 Asian U23 Women's Volleyball Championship. She was also selected by the Philippine Olympic Executive Council to be the flag bearer for the Southeast Asian Games this June 2015. “We are delighted to welcome Miss Alyssa Valdez to the Chevrolet family. We truly appreciate her contributions to the sport of Volleyball and the inspiration she brings to many young Filipino aspirants.” said Atty. Albert B. Arcilla, President and Managing Director of Chevrolet Philippines. “Alyssa embodies the characteristics that best represent the Chevrolet Sonic – smart, vibrant, capable and strong in mind, body and heart.” Concludes Atty. Arcilla. Apart from Alyssa’s tremendous on-court talent, her Filipina beauty is undeniably mesmerizing. Her five foot nine athletic frame paired with her disarming smile and star athlete charisma make Alyssa stand out. Alyssa effortlessly transforms from fierce and strong Volleyball spiker to hipster, cool, girl next-door, college student to a stylish and sophisticated young lady. Whatever persona Alyssa projects, she remains the simple and modest Batangena who always makes a special effort to accommodate fan requests and credits her teammates and family for her successes. Like Alyssa, her car of choice, the Chevrolet Sonic is also a cut-above-the-rest. The Chevy Sonic is a subcompact sedan that comes in two striking forms: in a 5-door sporty hatchback design that exudes fun and athleticism and a 4-door stylish sedan that radiates sophistication and class. Built by a global brand with a strong heritage of over a hundred years of automotive experience, the Sonic is a strong and dependable vehicle that is equipped with modern technological features that add up to a unique and fun Chevy experience. Powered by a 1.4L ECOTEC engine with a 6-speed automatic transmission, the Sonic delivers commendable driving performance and pocket friendly fuel efficiency. Adding to the Chevy Sonic’s arsenal are cool comfort and convenience features like steering wheel mounted audio controls, rear parking sensors, Bluetooth connectivity and the Chevrolet Mylink; a touchscreen infotainmnent unit that is compatible to most smartphones today. With its easy to use interface, users can synchronize and access phone contacts, apps, photos and music files through the Chevrolet Mylink system, keeping you always connected to everything that is important to you. Further reinforcing the Sonic’s dependability is its 5 year, 100,000 kilometer warranty that assures* its new owners a worry-free and hassle-free ownership experience. Both the sedan and hatchback variants of the Sonic have modern and modish interior designs with premium materials. The car’s Corvette-inspired cockpit and motorbike design instrument cluster complement the sporty exterior and relive the rich racing tradition of the Chevrolet brand. The Sonic hatchback variant has flexible foldable back seats that provide more room for loading requirements and abundant storage spaces to organize loose items. The Chevy sub-compact car shows that form and function can co-exist. The Chevy Sonic SRP starts at P748,888.00.